An 83% majority of the public says vaccines for diseases such as measles, mumps and rubella (MMR) are safe for healthy children, while about one-in-ten (9%) think such vaccines are not safe. An additional 7% volunteer that they don’t know. 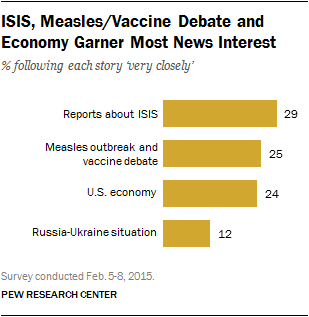 Majorities across virtually every demographic and partisan group view the vaccines as safe. However, there are some differences in attitudes, with less educated people and younger adults more likely to say they are not safe. The new national survey by the Pew Research Center, conducted Feb. 5-8 among 1,003 adults, finds Republicans (89%) and Democrats (87%) generally agree that such vaccines are safe for children who are healthy. Roughly nine-in-ten college graduates (92%) see vaccines for MMR as safe for healthy children. This view is somewhat less widespread among those with some college experience (85%) or a high school degree or less (77%). Three-quarters or more in every age group say vaccines for MMR are safe. However, among adults 50 and older, 90% express this view, compared with 77% of adults 18-29 and 81% of those 30-49. A separate Pew Research Center survey of opinion among the public and scientists about science and society found widespread support for requiring childhood vaccinations: 68% of the public said children should be required to be vaccinated, while 30% in that survey said parents should be able to decide not to vaccinate their children. Young adults were more likely to say vaccinations should be a parental choice, while there was no significant difference in attitudes based on education. The Centers for Disease Control and Prevention (CDC) reported 102 cases of measles in 14 states in the first 30 days of the new year, most of which were linked to an outbreak at Disneyland in California. Last year’s 644 cases were the greatest number of cases since measles was eradicated from the U.S. in 2000, according to the CDC. Parents and non-parents have similar outlooks about the safety of childhood vaccines. Eight-in-ten adults (80%) who are a parent or guardian of a child under 18 say the vaccines are safe for healthy children. Among those who are not parents of children under 18, 85% say the vaccines are safe. A similar share of women (85%) and men (81%) say vaccines for MMR are safe for healthy children. Whites (87% safe vs. 6% unsafe) express a more positive view than non-whites (76% vs. 17%) about the safety of such vaccines. Those who paid at least some attention to news about measles and vaccinations were more likely to say vaccines for MMR are safe for healthy children. Among the 80% of the public who followed the story “very,” “fairly,” or “not too closely,” 87% say vaccines for MMR are safe for healthy children, 8% say they are unsafe and 5% don’t know. People who followed the measles outbreak and vaccination debate “not at all closely” (19% of the public) are less likely to say the vaccines are safe. Among that group, just two-thirds (66%) say vaccines for MMR are safe for healthy children, while one-third say they are not safe (16%) or volunteer that they don’t know (17%). Those who say that vaccines for such diseases as measles, mumps and rubella are unsafe for healthy children (9% of the public) were asked why they feel this way. They cite a variety of concerns; no single factor predominates. Some are skeptical about the effectiveness of vaccines, while others question why healthy children should be given the vaccines. Still others say they distrust pharmaceutical companies. 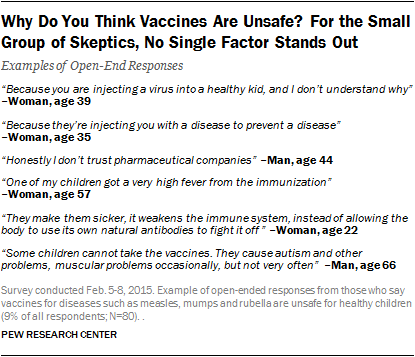 Notably, very few respondents specifically raise concerns about vaccines causing autism or other disorders. 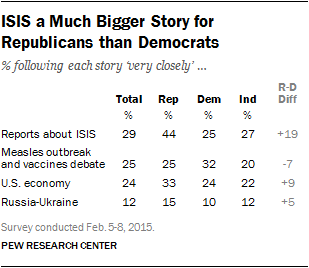 Nearly three-in-ten Americans (29%) followed news about ISIS very closely. Comparable percentages say they very closely followed news about the recent measles outbreak and the debate over childhood vaccines (25%) and U.S. economic news (24%). Just 12% paid very close attention to the situation involving Russia and Ukraine. Republicans are far more likely than Democrats or independents to say they followed news about ISIS very closely (44% vs. 25% and 27%, respectively). The partisan differences were much smaller in attentiveness to the week’s other stories.